Chaim Gross, a Modernist sculptor perhaps best known for his stylized wood sculptures of dancers and acrobats, lived through almost the entirety of the 20th century, his life intersecting with many of the hallmark events high school history teachers highlight in surveys of modern history. Born in 1904 to an Orthodox Jewish family in the Carpathian Mountains of Austrian Galicia, a young Gross endured the turmoil of World War I as a refugee wandering Eastern Europe, and came out on the other side of the conflict determined to become an artist. Renewed violence against Jews after the war’s end prompted Gross to secure passage to Ellis Island in 1921. 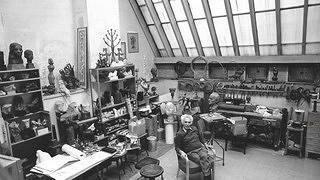 Chaim Gross seated in the studio of his Greenwich Village townhouse. 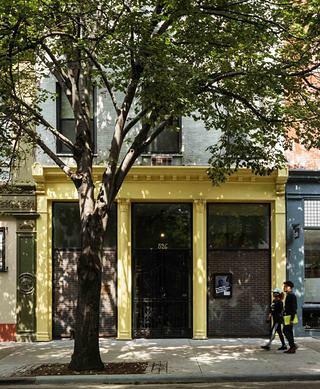 A modern view of the Greenwich Village townhouse Gross and his wife, Renee, moved into in 1963. In the 1920s, Gross lived on the Lower East Side of New York City while he built his career working in the Modernist style becoming increasingly accepted in New York art circles. During the Great Depression, Gross worked with the Works Progress Administration, teaching art and creating works for schools and federal buildings. Hearing about the horrors of the Holocaust and visiting the newly formed state of Israel following World War II ignited in Gross a renewed interest in his Jewish heritage, which became a heavy influence in his art. During the 1960s, Gross decided to settle down in the up-and-coming neighborhood of Greenwich Village, which had become a haven for artists of all kinds (Bob Dylan would play music just around the corner), settling in a four-story townhouse on LaGuardia Place, honored in 2016 with a historic marker from the Greenwich Village Society for Historic Preservation. Today, The Renee and Chaim Gross Foundation maintains the house as a space to educate the public about Chaim Gross’ artistic legacy. 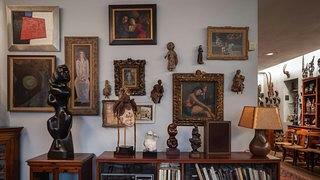 The third-floor living room space of the townhouse, displaying Gross' large art collection. The dining room of the Gross' Greenwich Village townhouse, where the vivacious couple entertained guests. 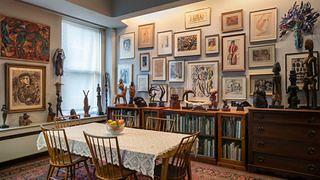 The house's gallery space, which now houses rotating exhibitions of art Gross collected alongside his own work. The first floor's sunken studio was designed by Gross when he renovated the historic townhouse after purchasing it in the 1960s. The gallery and studio space on the house’s first floor are maintained much like they would have appeared in Gross’ time, as is a third floor living area. The second floor of the building, which was rented out when Gross occupied the house, was converted into a gallery by his wife after Gross’ death in 1991. 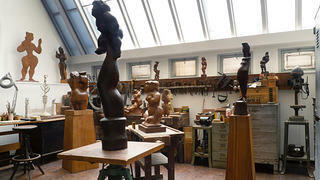 The Foundation continues that use, offering changing exhibitions of both Gross’ own sculpture and the art he collected. 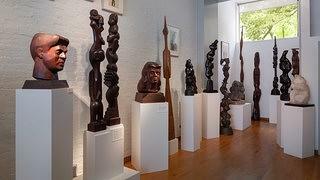 Gross was an avid collector of American and International art with a particular passion for African wood sculpture—appropriate since Gross himself was revered for his work in direct carving, an artistic style that emphasized sculpting shapes following the natural shape and grain of a material rather than imposing a preconceived design. 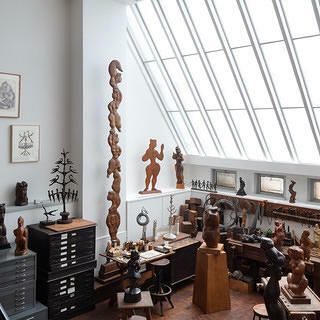 Guided tours, lectures, and educational programming perpetuate Gross’ legacy, which encompasses headlining exhibits at the Whitney Art Museum and the Smithsonian American Art Museum as well as being the subject of multiple books. And the Foundation joined the National Trust’s Historic Artists’ Homes and Studios program earlier this year. The studio prior to renovation. 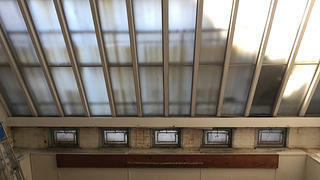 It was during one of these guided tours in 2017 that a significant issue with the historic building revealed itself to the Foundation’s staff: Water was dripping from the bottom of the studio’s signature skylight, designed by Gross himself and considered to be the crowning feature of the building. Experts were called in to assess the problem while staff quickly got to work documenting how the studio was set up in order to ensure that all of the historic art and artifacts being removed from the studio for protection could be placed back in their original places after the restoration work was finished. Generous grants from the New York Landmarks Conservancy and the NYC Landmarks Preservation Commission funded a meticulous renovation of the skylight by preservation architects at Jan Hird Pokorny Associates. While the initial diagnosis for the cause of the water infiltration was the expiration of the window’s sealants, installed in 1963 with a 50-year lifespan, other subtler issues soon revealed themselves. A mastic sealant on the brick walls outside the window had peeled away from the brick and formed a trough that directed water down to the bottom of the wall, where it pooled and was absorbed. 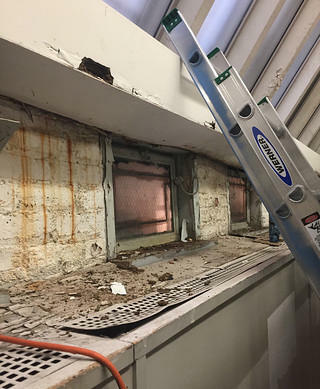 A wooden soffit along the bottom of the skylight was drawing moisture into the building as well, so the wood was replaced and covered in metal on the exterior. 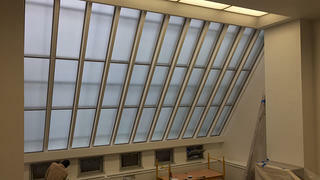 Once those issues were addressed, the exterior portion of the double-layer glass on the skylight was replaced. The interior wall beneath the skylight before restoration. The studio's massive skylight, put in the building by Gross, prior to its recent renovation. 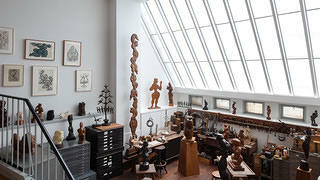 The studio post-renovation with historic objects reinstalled in the space. Putting the studio to rights again after the restoration work was finished provided an opportunity to fine-tune the studio’s curation and ensure it looked much like it did in Gross’ time. 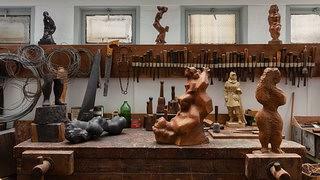 Archival photographs of Gross in the studio have served as a guide. 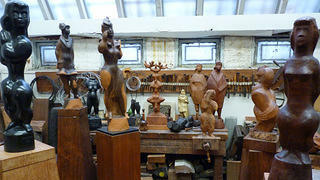 While the original setup of the studio had largely been maintained over the years, there was some shifting as to what sculptures were on display as items were loaned out or returned. In arranging the refreshed studio space, staff sought to regain the distinct rhythmic feel of Gross’ design choices. The studio looks much as it would have during Gross's tenure (though a bit less cluttered). The studio space was reopened to the public in May of 2018 and can be seen on guided tours of the historic townhouse. The Foundation was recently awarded a grant from Preserve New York to conduct a condition report of the entire building in order to create a plan for how to best protect the building for future years. In addition, the Foundation continues to build out its robust interpretive programming, most recently with the launch of a volunteer educator program, which will expand the nonprofit’s ability to give tours. In the 21st century, Gross’ legacy lives on, not just through his wood carvings, watercolors, and bronzes, but also in the walls of the building where he spent the last three decades of his life.